Note: implementation dates for Canada and some U.S. states are expected, not actual. New legislation outlining the federal government’s plan to regulate recreational marijuana will be tabled this Thursday. 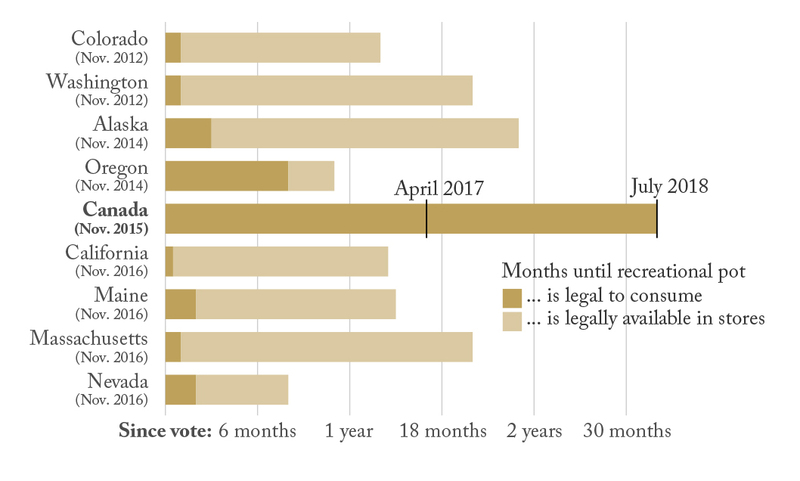 In this edition of Graphic Intelligence, we profile the anticipated timeline of Canada against the eight U.S. states that have made similar moves so far. If reports of a July 1, 2018 start date are accurate, Canadians will have waited almost three years since the election of a federal government advocating legalization. U.S. states that have had a successful ballot initiative in favour of legalization took about two months on average to pass laws legalizing the recreational consumption of marijuana, with more complete legislation regulating sale and taxation following months or a year later. In contrast, the federal government has been taking its time before making any changes. But while a series of public consultations and a federal task force may have provided valuable input, consumers and producers having to live with a long period of uncertainty may be forgiven for thinking that the grass looks greener on the other side of the border.